Keil’s Antiques has a proven reputation for value and tradition that is rare in the world today. Four generations of imaginative clients and antique lovers have trusted the Keil family name for exceptional quality, value and service. Founder Hermina Keil emigrated with her family as a girl to St. Francisville, Louisiana from Alsace-Lorraine. As an adult, she moved to New Orleans to pursue her passion of opening an antique store in the French Quarter. 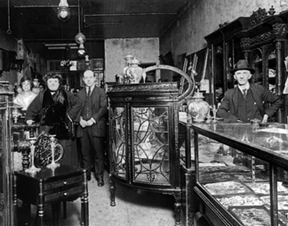 Keil’s Antiques opened its doors in 1899. At the time, only one other antique store existed in the Vieux Carré. Hermina Keil became a renowned expert on American furniture and silver and counted presidents Theodore Roosevelt and Woodrow Wilson among her clientele. Her son Morris Keil recognized the growth and demand for French and English antiques in the 1920s. With the support of his wife Marguerite Poupart, the shop began to import eighteenth and nineteenth century pieces – including Louis XV, Louis XVI, Chippendale, and Georgian styles. Keil’s Antiques grew to be an acclaimed authority in these areas, recognized as an arbiter of excellent taste. As the business grew, all members of the Keil family held active roles in the sales and restoration portions of the business, transferring the artistry and knowledge only held by skilled craftsmen from generation to generation. Raised amidst the elegant antiques in the shop, Andree Keil traveled to Europe with her parents several times each year. She became immersed in their way of thinking and witnessed the challenges of the antique business first-hand. When her father died in the early 1970s, she devoted all of her time to assisting her mother in the business. 40 years later, she considers her primary role to be that of caretaker as she maintains Keil’s for another generation of seasoned, well-prepared family members. “The antique business is still fun, so I think I’ll hang around a bit longer,” says Moss. Keil’s Antiques prides itself on maintaining their family-business tradition of providing attentive, knowledgeable service to all guests. A well-versed staff guides customers through 24,000 square feet of show rooms displaying beautiful, high-quality pieces sold at fair prices. Each piece in the store has been personally selected by Keil family members who grew up around antiques, formally studied art history, and served lengthy apprenticeships before advancing to senior positions. In sum, they’ve lived antiques all the years of their lives and have worked passionately to acquire expertise and experience. Present family members Andrée, Keil and Peter Moss, who are direct descendents of Hermina Keil, personally select every piece sold at Keil’s Antiques. The store’s inventory reflects discerning judgment and personal tastes, and its daily operations draw on deeply rooted ties with valued customers and trusted sources. The sterling reputation of Keil’s Antiques has been cultivated for more than 112 years, and serves as the foundation of the store’s business. Today, Royal Street is an important center of the international antiques market and attracts collectors from far and wide. Two other distinguished Royal Street antique stores, Moss Antiques and Royal Antiques, are also operated by members of the Keil family. For many who know New Orleans, the antique stores of Royal are as essential to the city’s culture as the flavorful cuisine, traditional music, and unique architecture. The glinting elegance of these beautiful stores captivates visitors and residents alike, and Keil’s Antiques is proud to be a beloved keystone of the French Quarter’s historical charm.